Tia Claims ensures a smooth, user-friendly digital experience for your self-service customers. At the same time, it improves efficiency for your claim handlers, allowing them to provide faster, more personal service to call-in customers. 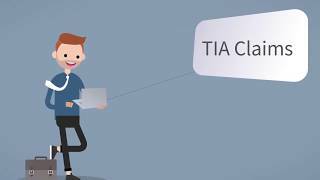 Tia Claims lets you give your customers a transparent platform for dialogue and more self-service opportunities in their preferred channels. Also, your claims handlers can take advantage of guided automated processes to enhance service, prevent leakage – and boost productivity. Because the Tia Enterprise Solution’s core structure is customer-centric information-driven and built to enable “one-stop processing”, it makes claims handling fundamentally smoother and more efficient. Lower costs and improved efficiency. Tia Claims is perfect for configuring the automation of processes to increase the profitability of your business. In the constant drive to save time and money, Tia Claims helps ensure that you still meet your customers’ demands and expectations. The automated processes in Tia Claims make for an excellent user experience for your customers. As well as boosting internal productivity, it can minimise the risk for manual errors, improve service levels, prevent leakage and reduce operational costs.